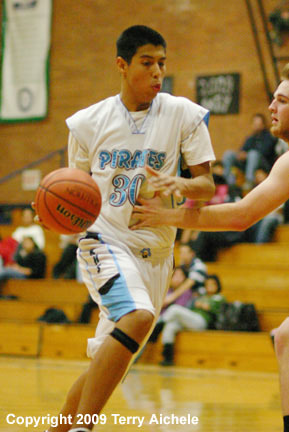 Riverside Pirate Jose Barajas grabs a rebound during the game on Tuesday. 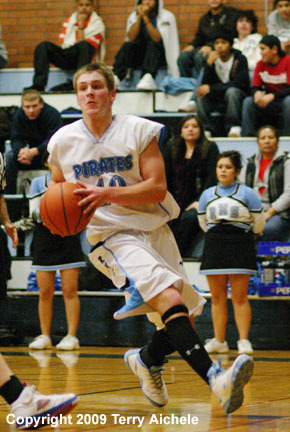 BOARDMAN - The Riverside Pirates defeated Sherman on Tuesday, January 6, 2009 by a score of 54-52. Sherman used a strong pressing defense that saw Riverside players often double and triple teamed defensively. Sherman held Riverside scoreless for nearly three minutes late in the first period. 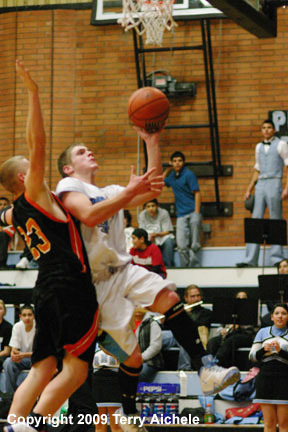 Jason Hendricks made two free throws and three pointer during the period. Sherman lead at the end of the period 14-12. Sherman held Riverside to just four points in the first four minutes of the second while scoring ten points to take a 26-16 lead. The pressure defense made it tough for Riverside but they slowly closed the gap with Sherman leading 32-24 at the end of the half. Jason Hendricks, Marco Carranza, Cain Murillo and Chase Simpson contributed to Riverside's scoring in the third. Sherman kept a solid lead throughout the period but Riverside was showing signs that they could break the pressure defense of Sherman. Sherman lead by eight, 45-37 at the end of the third. Riverside held Sherman to just two points for over five minutes of the fourth period. The Pirates scored seven during that time to close to within five, 44-47. 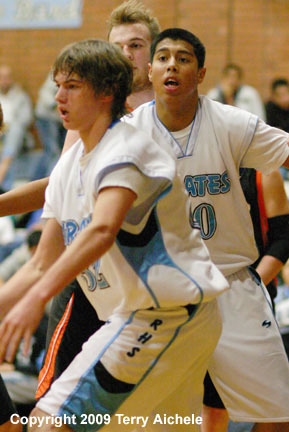 Hendricks hit a trey and Murillo hit a hot streak to help give the Pirates a 50-49 lead with 1:32 to go in the game. Levi Kauffman went to the line for Riverside and hit two freethrows to give Riverside a 52-49 lead at the 38 second mark. James Stroud of Sherman hit a three to tie it up at 52 with 15 second to play. Hendricks took the ball on the inbounds pass and drove throught three Sherman defenders for a layup and the 54-52 lead. Sherman tried a court long inbound pass that went out of bounds giving the ball back to Riverside with three seconds to play. Barajas was on fouled following the inbound pass and missed his freethrow. With less than a second to play Sherman couldn't score giving Riverside the 54-52 win. 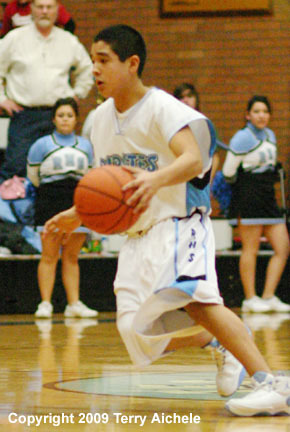 LEFT - Cain Murillo of Riverside with the ball. 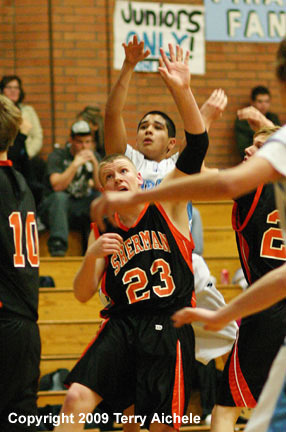 RIGHT - Cain Murillo of Riverside takes a shot while being closely defended by Sherman defender Dylan Wood. 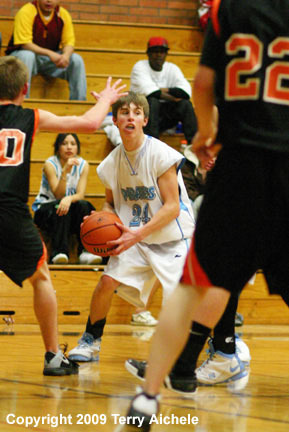 LEFT - Levi Kauffman of Riverside looks for an opening. RIGHT - Marco Carranza with the ball. LEFT - Chase Simpson and Marco Carranza of Riverside try to find an open space. RIGHT - Jason Hendricks of Riverside squeezes between Sherman defenders. LEFT - Marco Carranza of Riverside looks around a Sherman defender. 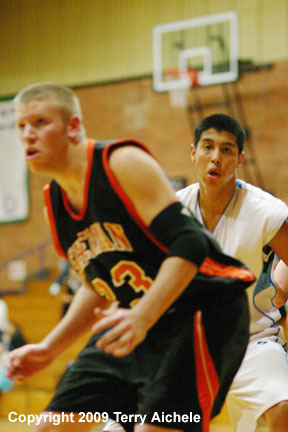 RIGHT - Jason Hendricks of Riverside drives to the basket late in the game.